The Board of Drivers For Survivors (DFS) will be kicking off the holiday season with the 3rd Annual Holiday Pancake Breakfast with Santa. The event will be hosted at Newark Community Park in tandem with the continued partnership of Newark Police Department, California and Alameda County Fire Department! 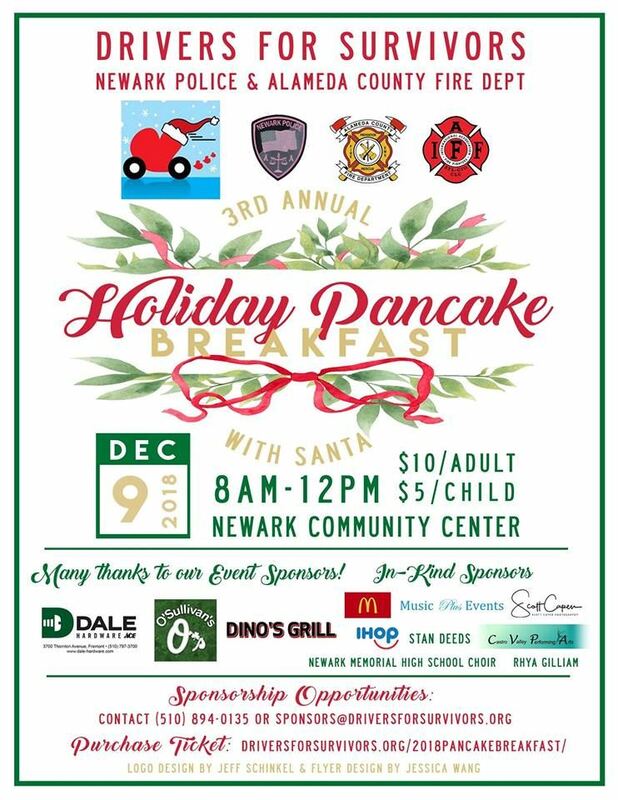 This heartwarming holiday FUNdraising event will be held at the Newark Community Center’s Social Hall on December 9th, 2018 from 8:00 a.m. to noon. Ticket price is $10/adult and $5/Children. Tickets can be purchased here. Raffle tickets will be available at $5.00/ticket or 5 tickets for $20.00; winner will receive a basket filled with gift certificates for dining and entertainment. There will be a warm and inviting breakfast with hot and cold beverages along with a silent auction items and entertainment/restaurant raffle basket. Santa will be arriving from the North Pole and visiting with us throughout the morning, and art table along with face painting. There will be information booths/ vendors and short performances interspersed throughout the morning between 9 to 10:30. There will be more opportunities to check out auction items and information booths between performances. Please call (510) 894-0135 for more information!